The Xiazhai Site of Xichuan is located at the north Xiazhai Village in Taohe town, Xichuan County, Nanyang City of the Henan Province, which is in between the intersection of Tao River and Danjiang Rivers. In order to coordinate the construction of infrastructures, the Henan Provincial Institute of Cultural Relics and Archaeology had conducted an extensive archaeological survey and investigation from March 2009 to January 2013 and exposed area measured 16,000 square meters. Based on the data from drilling and excavation, area of the existed site is around 600,000 square meters with deposits from various periods including Ming and Qing Dynasties, Han and Tang Dynasties, Eastern Zhou, Western Zhou, early Erlitou Period, Wangwan Culture (Stage 3), Shijiahe Culture and Yangshao Culture. Most of them are from prehistoric and Eastern Zhou. More than 2,800 features from various periods were also identified including ash pits, ash ditches (moat), water wells, pottery kilns, burials, urn burials, etc. More than 1,600 small artifacts from a variety of textures including silver, bronze, iron, pottery, stone, jade and bone were discovered. Around 2,000 samples were collected for different data analysis. The most prominent finding was the exposure of a settlement encircled by moat from the Yangshao Culture combined with ash pits, ash ditches, moat, pottery kiln and burials. The size of moat G30 is the biggest and in trapezium with 2.95-3.3m in width and 2.1-2.7m in depth. The cut of the moat was very deep with a “V” shape cross section. A smaller ditch G31 in the exterior of G30 with 1-1.5m in width was in parallel with G30. Cultural remains from Yangshao period were mainly identified in G30. It is believed that G30 and G31 were the boundary ditches of encircled moat settlement in Yangshao Period. Unearthed artifacts including vase with small mouth and pointed base, basin, coarse pottery pot with narrow rim, ding in cauldron style. Based on the typology of artifacts, they can be dated as middle Yangshao Culture. The main remains of the Shijiahe culture were consisted of ash pits and burials. Shapes of ash pits include circle, nearly square and irregular. 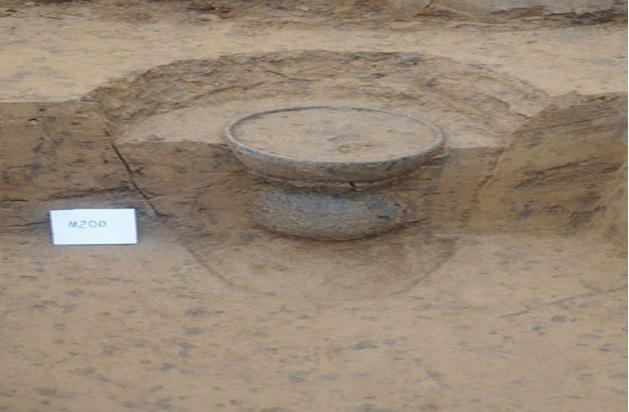 The unearthed artifacts including red pottery cup, pot with horizontal weaving pattern, high neck urn, ding tripod with flat and wide legs and grinding bowl. The most important finding was a cemetery where 117 rectangle earthen shaft tombs were discovered from Late Yangshao culture to Shijiahe Culture. Four types of tomb can be classified in accordance with the direction of the head of the dead. Type I was facing south from Late Yangshao period and 58 tombs in total. A pottery was discovered in M72 and M106 respectively. 22 jade and stone yue axes were discovered in the rest of the burials. The typology of the yue axe was similar to those discovered in Lingbao xipo cemetery and similar type was also found in Hanshan Lingjiatan site. Type 2 was facing west with 43 tombs in total. Amongst them, 28 tombs contained pottery grave goods mostly arranged in waist pit, and appear in group. The assemble ware was jar with long neck or a bowl placed on ringed-foot gui vessel, and the bottom of the bowl was perforated. In M86, M89 and M198, other than pottery grave goods in waist pit, a reddish pottery cup was also identified near the skeleton. Analyzed by the grave goods, the date of this type tombs belong to early Shijiahe culture, or even much earlier. Type 3 was facing north and 13 tombs in total and 7 contained grave items. Amongst them 4 tombs’ pottery grave goods and yue axes coexist in the waist pit simultaneously. They can be dated to Shijiahe Culture but were a little bit later than the tombs of type 2 which only contained pottery grave goods. M207 was 2.6m in length and 1.5m in width with traces of wooden coffin. One extended supine skeleton was identified and grave goods including jade yue axe, small stone chisel, jade bracelet and a small pottery pot were found in the left side of the dead. 6 pieces of pottery urns and 3 clay artifacts were found in the two sides (East and West) of the exterior of the coffin. In addition, pottery were found in the waist pit under the pelvis of the dead. This cemetery is regarded as the largest scale and richest grave goods in southwestern Henan and northwestern Hubei areas from Shijiahe Culture. Only 3 burials were regarded as Type 4 and all of them were without grave items. Judging from the stratigraphy, they can be dated to Late Yangshao Culture to Shijiahe Culture. The main remains of Wangwan Culture (Stage 3) were ash pits and urn burials, with a few ash ditches and pottery kilns. 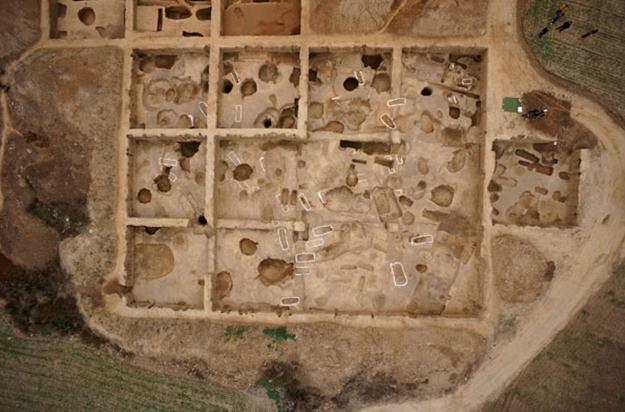 45 urn burials were discovered in an intensive layout from the same layer except W1 and W2. The major funerary utensiles include cauldron, pot, urn and the deceased were infants. Grave goods include ding tripod with flat and wide legs, cauldron, urn with small opening and high neck, pot with wide opening, basin with ringed-foot, pot stand with narrow waist, etc. The decoration was mainly in weaved pattern. Other than that, two crafted bones in dragon style with C shape were discovered in ash pit H189. A nearly complete one was measured around 2.7 cm long with a clear distinctive head and horn, interconnected between the head and tail, which was extremely rare. Remains from Late Wangwan Culture (Stage 3) to Early Erlitou cultural period were unified. 28 earthen shaft tombs were discovered in an intensive layout and sequential alignment but the direction of the heads were different. Within M7, combination of various artifacts including ceramic stem cup, gu goblet, pot with two handles, stone axe, stone chisel were discovered in which the stem cup and gu goblet share characteristics from Early Erlitou cultural period. Other burials unearthed single artifacts such as pot-shaped ware or pot with single handle, which was sharing some Wangwan Culture (Stage 3) style. But the pottery double handle pot and single handle pot reflected a close connection with the Xia period remains within the upper course of Danjiang River in Shaanxi area. Judging from the tradition of the manipulation of stone burial items, they may probably from the Jianghan area with mixed cultural characteristics from Central Plain, South Guanzhong and Western Jianghan Plain. The number of remains from Western Zhou period was relatively small with only 21 ash pits discovered. The shapes of these ash pits including circle, oval, rectangle and irregular. Artifacts such as different types of li tripods, dou stem cup, yu vessel, pot and urn etc. from late Western Zhou period. A complete set of male black bear skeleton was discovered in H380, which was rarely seen. Remains from Eastern Zhou scattered all over the site, such as ash pits, ash ditches, water wells, small earthen shaft tombs and a severely disturbed pottery kiln. Pottery artifacts including li tripod, yu vessel, pot, dou stem cup, basin, which belonged to Chu culture. Features from Han Dynasty were mainly numerous rectangle ash pits in straight alignment, which is similar with the structure of earthen shaft tomb but no human skeleton and grave goods were identified. The characteristics of the information need to study further. More than 30 brick chamber tombs from Eastern Jin to Sui and Tang Dynasties were discovered. Burial items including green porcelain pot with plate-shaped mouth, porcelain bowl with short ringed-foot, pottery pot, bronze mirror, silver hairpin, bronze coins and etc. with distinguish local characteristics.